On November 1, 1946, Karol Wojtyla was ordained to the Catholic Priesthood. 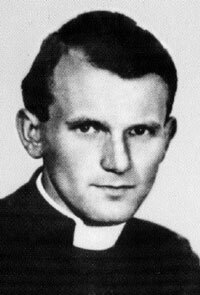 Joining the “underground” seminary while the Nazi Empire still ruled Poland, Wojtyla knew his calling; his vocation was that of a Catholic priest. As many of you know, November 1, is the Solemnity of All Saints. This must have been a glorious day in the life of Karol Wojtyla and the other men ordained with him since it is the day the Church celebrates the lives of the many saints that lived lives of heroic virtue. One of the saints that impacted Wojtyla’s life is the great mystic – St. John of the Cross. St. John impacted his life so much that one of his two doctoral dissertations was written on his subject of faith. After studying in Rome, he returned to Poland and was a parochial vicar (associate priest) of various parishes in Krakow as well as a chaplain to university students. Since Catholic priests were forbidden to associate with university students, many of his students warmly called him “Uncle” instead of Fr. Wojtyla to protect him from the socialistic regime of Russia that occupied much of Eastern Europe. After more years of study and his second doctorate dissertation, he became a professor of Moral Theology and Social Ethics in the major seminary of Krakow and in the Faculty of Theology of Lublin until he was ordained the Auxiliary Bishop of Krakow. Even as Pope of the Catholic Church, Karol Wojtyla (Blessed John Paul II) loved being a Catholic priest. 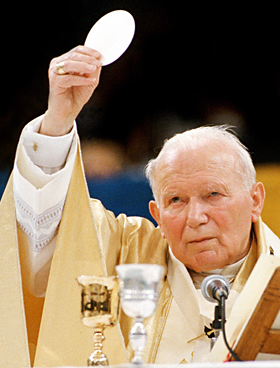 His great love for the Holy Eucharist was witnessed many times over during this 26-year pontificate. He had a great devotion to the Blessed Mother and often taught on the Lives of the Saints. His impact on the Catholic Church and the priesthood will resound for decades to come. In his Letter to Priests on Holy Thursday 2005, he says, “We priests are the celebrants, but also the guardians of this most sacred mystery. It is our relationship to the Eucharist that most clearly challenges us to lead a “sacred” life. This must shine forth from our whole way of being, but above all from the way we celebrate. Let us sit at the school of the saints! The Year of the Eucharist invites us to rediscover those saints who were vigorous proponents of Eucharistic devotion (cf. Mane Nobiscum Domine, 31). When I read this quote from Blessed John Paul II, it reminds me of the many great men, the new breed of holy priests; that are answering the call to sacrifice their lives for the Catholic Church. It’s a blessing to know so many here in the Diocese of Phoenix and to work for two that exemplify the words of Blessed John Paul II – Fr. Kilian McCaffrey and Fr. Chad King. May Blessed John Paul II, on this great solemnity of All Saints, intercede for our priests.